CP Extrusion can make your product multicolored or multiflavored with the use of only one extruder. A specially designed mixing head, called "Cross mixer" (X-mixer), is fitted on the extruder including color and flavor injectors. The amount of colors can vary from 1 to 6 or even more. The main stream leaving the extruder is divided corresponding the required amount of colors and / or flavors. Special mixing devices are installed to ensure a homogeneous mixing of color and flavor into the mass. In the downstream mounted die the streams come together to make multicolored products or multiple products of various colors. It is even possible to switch colors within one single strand. Reliability and accuracy are extremely important for a consistent product. 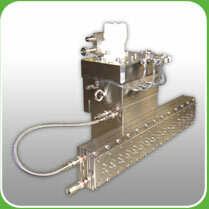 We acknowledge the importance of a thorough dosing and mixing system. Please find out how to improve your product consistency by contacting us.